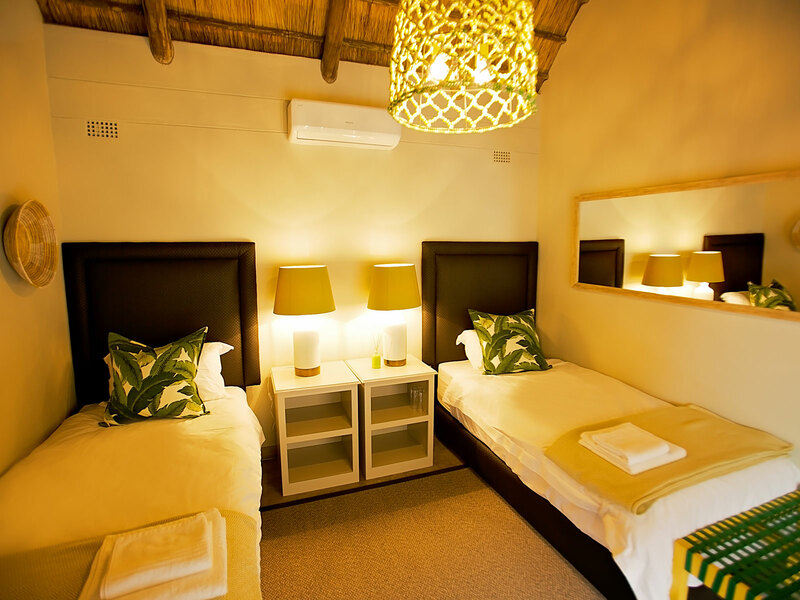 The Village chalets are beautiful yet budget conscious. 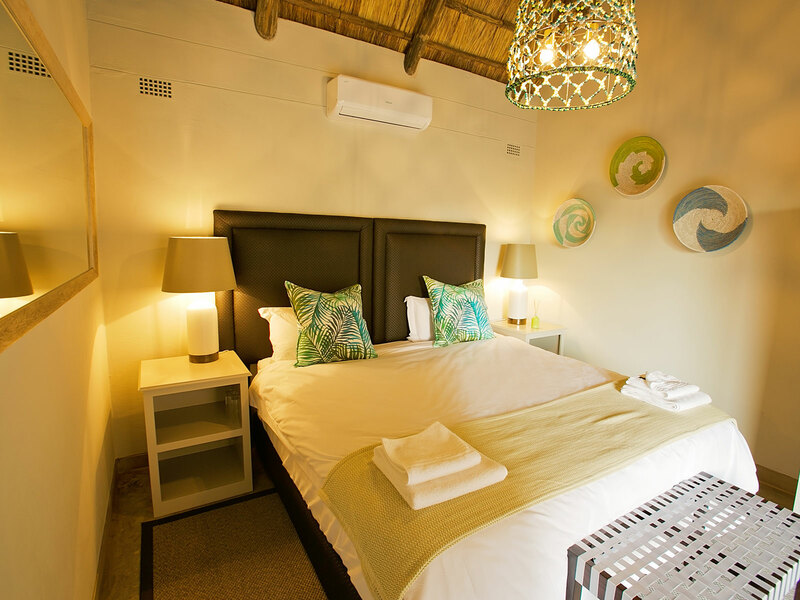 Each room is subtly scented the moment you enter – and perfectly air conditioned (pleasant throughout the whole year – but really desirable in Southern Hemisphere summer months). 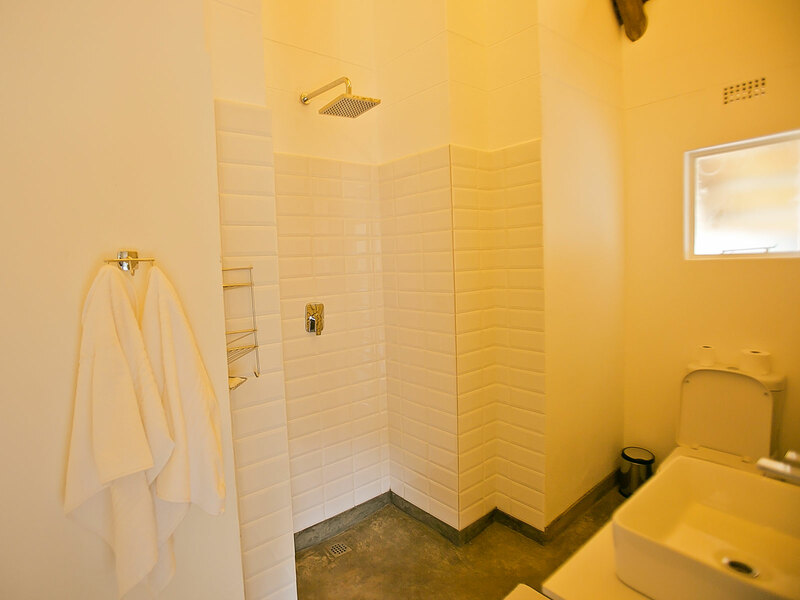 Each chalet has a private bathroom. 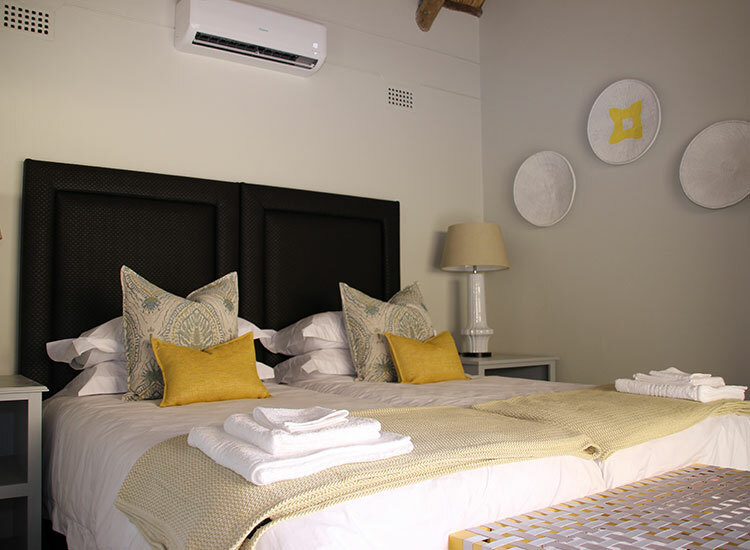 Crisp clean linen on wonderfully comfortable beds. A delightful boutique shower room. 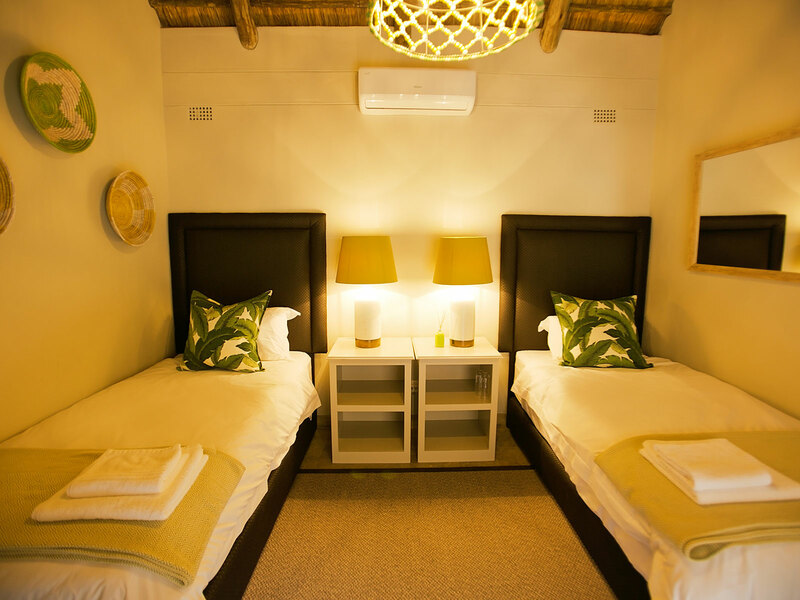 The chalets allow you to have style and elegance at really affordable prices, so you can access more of the ‘’once in a lifetime’’ activities available in Victoria Falls. 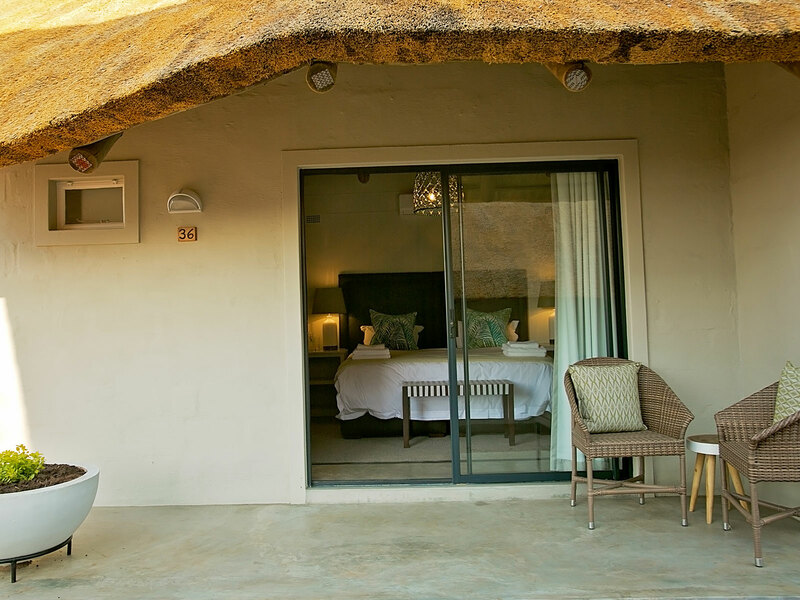 You are adventurous enough to come to Africa – but allow yourself a little indulgence. 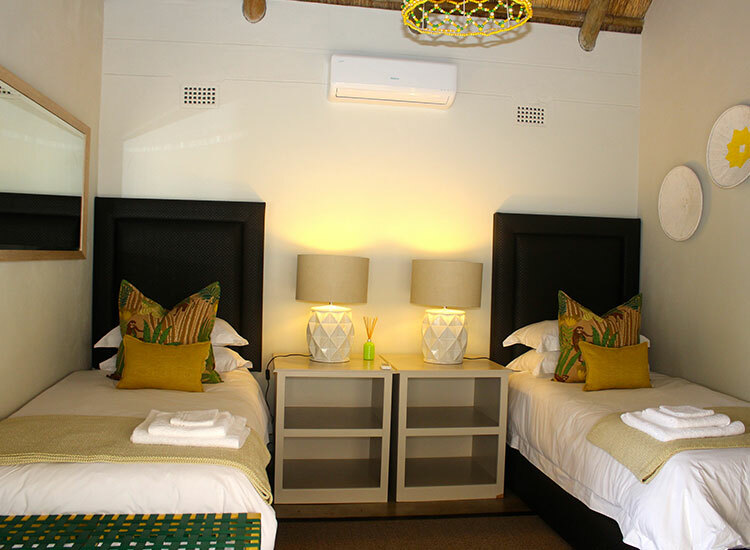 No minimum stay requirement and daily housekeeping is included in the room rate. The “Flight of Angels” is an amazing journey over the 1700m vast curtain of water known locally as the “Mosi oa Tunya” (the smoke that thunders) and along the Zambezi River and the Zambezi National Park. 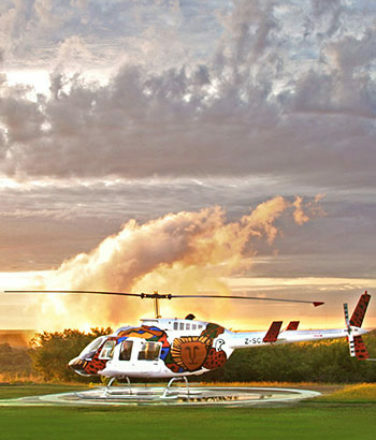 Passengers are treated to an unforgettable helicopter journey comprising of 4 circuits (2 on either side) offering unrivalled spectacular views, photographic, and filming opportunities and putting the full breadth and height of The Falls into glorious perspective within the surrounding environment. Jump into the rainbow at the Worlds greatest Bungee Jump. The original, the one and only, the must do, the ultimate thrill! 4 seconds of freefall, 111m of Pure Adrenalin! 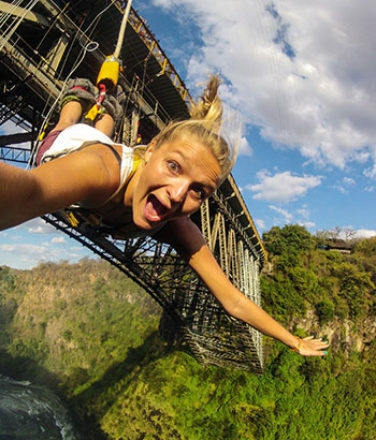 Off the famous Victoria Falls Bridge, with a spectacular backdrop of the majestic Victoria Falls, move to the edge, arms out and 5-4-3-2-1- BUNGEE leaving yourself plummeting towards the rumbling waters of the rapids of the Zambezi River and let the adrenaline flow. 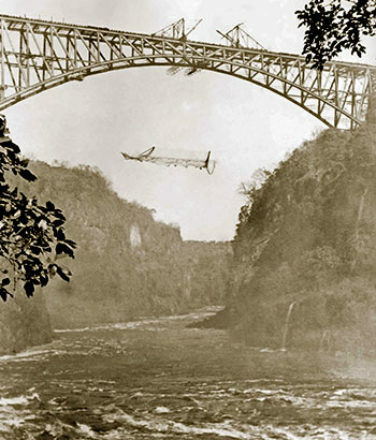 The Victoria Falls Bridge was built in 1905 using revolutionary engineering methods for its day. The Historic Bridge Tour is a journey through 100 years of Victorian engineering to the heart of Cecil John Rhodes’ vision of a Cape to Cairo railway. The Tour includes a light hearted but informative talk on the history of the bridge, magnificent views of the rapids, rainbows and majesty of the Victoria Falls and Batoka Gorges on the walkways actually underneath the bridge and an opportunity to see a bungee jump up close. The Historic Bridge Tour is a wonderful family experience full of theater, facts and adventure set against the glorious backdrop of the Victoria Falls which can be enjoyed by all ages. The high water run operates as river rises following the early rains and subsides as the dry season commences. The journey begins 10km downstream of the Falls starting at the Overland Truck-eater (Rapid 11) through to The End (Rapid 24) and includes the Mother (Rapid 13) at its brooding best. The river Journey is about 15km. A full day Safari package comprising a Cruise on the Chobe River and a Game Drive in the world famous Chobe National Park. Only an hour’s drive from Victoria Falls, the Chobe National Park in Botswana is home to one of the largest game concentrations in Africa. 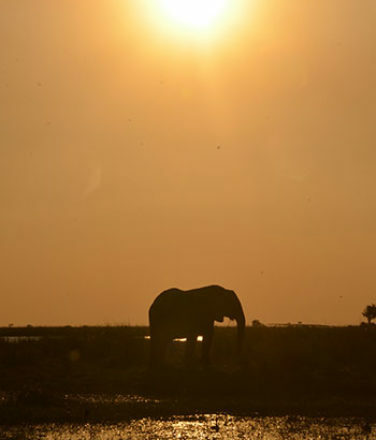 Bordered by the banks of the breath-taking Chobe River, it is famous for its rich elephant and lion population. 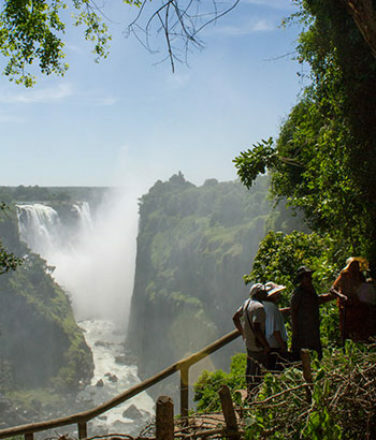 The tour departs daily from Victoria Falls where guests are transferred by road for 70km to the border where their Botswana guide will meet them after immigration procedures. Guided Victoria Falls Tour. Enjoy a guided tour of one of the Seven Natural Wonders of The World. A must see when visiting Victoria Falls. 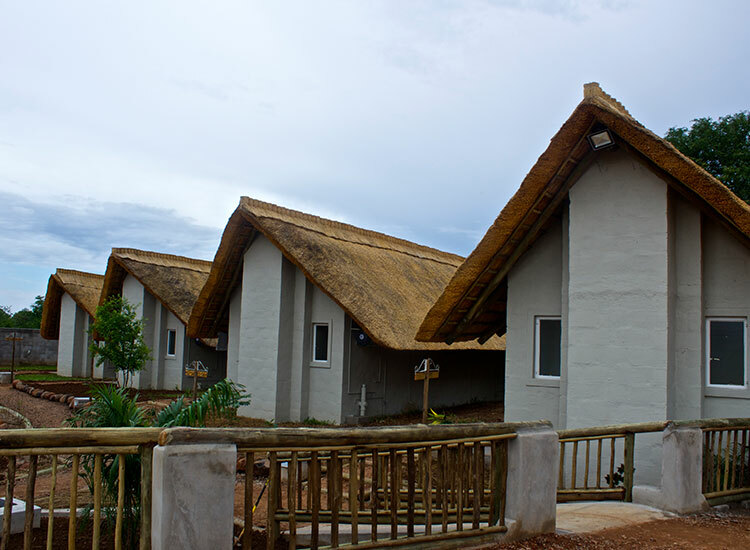 As you enter the Victoria Falls rain forest you will notice a change in vegetation. This tropical rain forest was created from the constant spray of the Victoria Falls. Explore the unique rain forest feasting your eyes on magnificent plant and bird life, whilst taking in the grandeur that is the Victoria Falls. You will be guided through the rain forest and stop at the different view points along the way. You will find yourself in awe as you witness the sheer magnitude of the Victoria Falls. This truly is an inspiring experience. The Victoria Falls will be in full flood between April and August. Be sure to wear a raincoat during these months as you will get soaked from the spray of the Falls. If you would like to view the Victoria Falls from a different perspective why not book a Helicopter Flight over the Victoria Falls. This will give you spectacular views of this magnificent attraction. 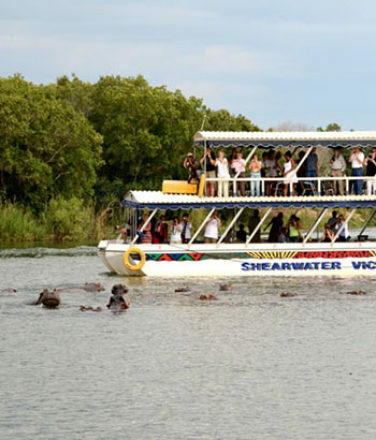 The Zambezi Sunset Cruise is a compulsory outing when in Victoria Falls and suitable for the whole family. 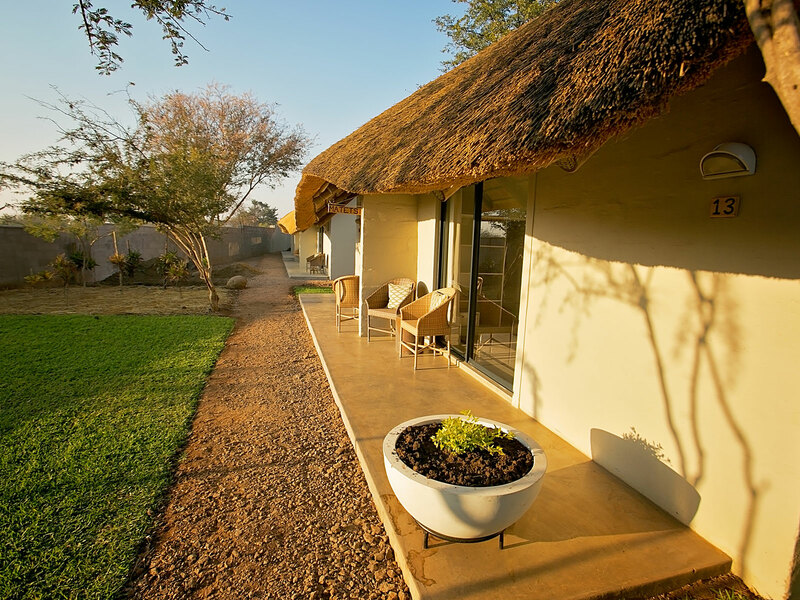 It is an ideal way to end an eventful day in Victoria Falls, providing an opportunity to unwind and relax in the timeless environment while enjoying complimentary sundowner drinks and light snacks. The whole trip is a build up to the gracious glow of the African Sunset on this vast body of water. The guides and crew are a font of knowledge about the river wildlife and will entertain you with numerous tales about local culture and historical exploration. 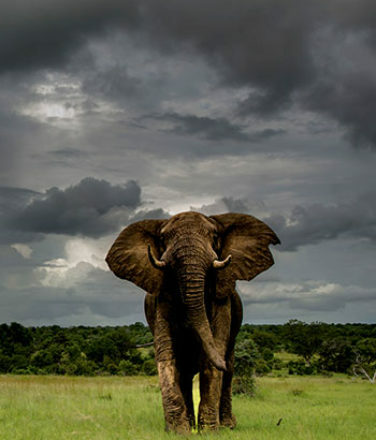 Savour a sunrise Game Drive on the Stanley and Livingstone Private Game Reserve, home to over 2,000 head of game and a rich variety of bird life. The guided safaris will take you through natural African woodland featuring frequent sightings of Wild Dog, Sable, Eland, Giraffe, Hippo, Crocodile, Hyena, Bushbuck, Impala, Baboon, Kudu and Waterbuck among others. At least three of the Big Five are sighted on almost all Game Drives with the highly endangered Black Rhino being the most exciting and rare, making this the best place to view game in the Victoria Falls region. After breakfast you will be picked up from the Hotel to the Top of the Gorge. 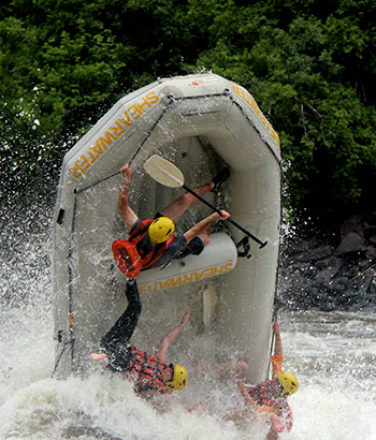 Armed with a walking stick, life jacket and helmet, you will take a walk down the Batoka Gorge and catch a Raft against the current of the Zambezi rapids, past the historic Victoria Falls Bridge to the Boiling Pot. 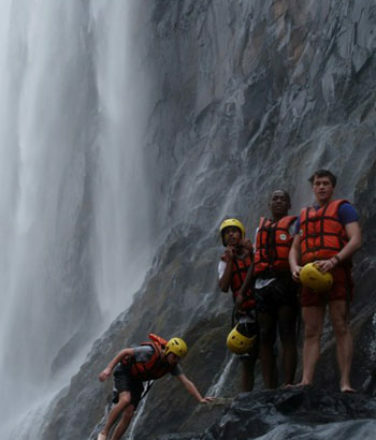 Once at the foot of the Victoria Falls, you will enjoy the experience of manoeuvring the rocky platforms and stand right under the spray of the thunderous Mosi oa Tunya. Take a dip in the pools between the rocks while the rainbows curl up around you in response to the bright sun above you. Visit our Shearwater Adventures website. © 2019 Shearwater Explorers Village. All rights reserved.